Buy the Year Long Bundle and Save BIG! Just click HERE. 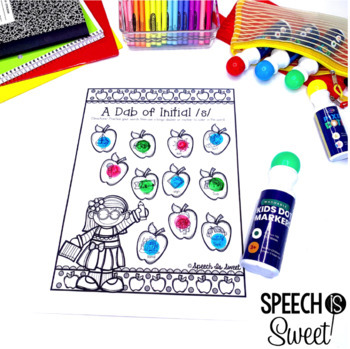 These A “Dab” of Speech and Language activities are designed to save SLPs precious preparation time! The major theme for the August packet is school! 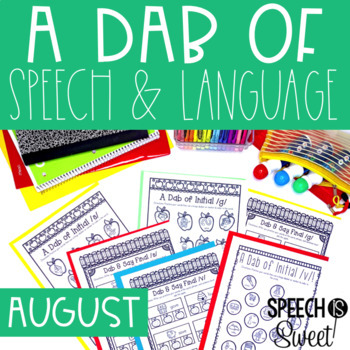 Speech: “A dab of…,” “Spin and Dab,” and “Dab and Say,” activities for /k, g, t, p, f, v, s, r, l, sh, ch, th/, consonant blends, and cvc words! 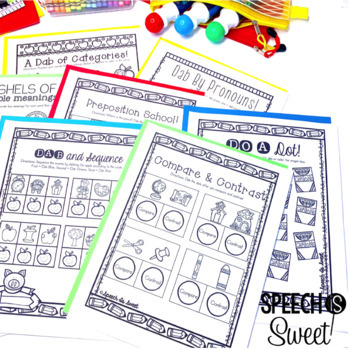 Language: Skills addressed are sequencing, prepositions, antonyms, synonyms, multiple meaning words, compare/contrast, describing, pronouns, and categories, pronouns. Fluency: Practice easy onsets, easy speech, and “dab out myths” about stuttering. 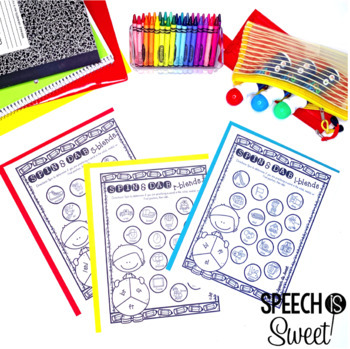 Open Ended: There are 5 do-a-dot pages included that can be used to reinforce any skill! This document is 50 pages long. Please ask any questions. Thank you for visiting my store! Have a wonderful day!